SCP-3917 in its inactive state. Special Containment Procedures: SCP-3917 is to be contained within a 30 cm by 30 cm acrylic box. The interior of the box must have a constant pressure of 0.65 atmospheres. No glass objects or electronics are permitted within 75 400 meters of the containment cell. All staff attending SCP-3917 must be free of silicon implants, glass accessories, and any other form of silicon based attire. Instances of SCP-3917-1 are to remain suspended in the hand santizer mixture at all times, and the levels of hand sanitizer in SCP-3917 are to be topped up every two weeks to account for evaporation. SCP-3917-2 is to remain sealed by a layer of acrylic resin indefinitely. Any materials contacting the outside surface of the resin are to be collected and incinerated. Description: SCP-3917 is a glass bottle, approximately 15 cm in height with an aluminum screw-on lid. 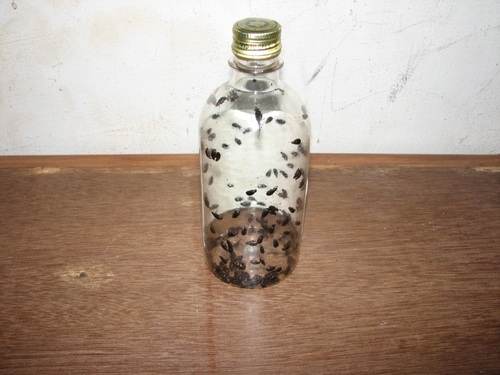 Inside the bottle are 106 105 beetles of the species luprops tristis1 suspended in a mixture of isopropyl alcohol, amniomethyl propanol, and glycerin in a combination consistent with that of many brand name hand sanitizers. At any point, if SCP-3917 is exposed to greater than one atmospheres of pressure, the object will activate and begin exhibiting an anomalous attractive property towards any silicon based compounds. All silicon based materials that move within approximately 50 meters of SCP-3917 are immediately pulled in the direction of the bottle. Materials attracted by SCP-3917 are anchored in place upon making contact with the glass surface of the jar or another anchored material. The bond between an anchored material and SCP-3917 is extremely strong. No known methods have been successful in separating an activated SCP-3917 from an anchored object. While barriers can be used to prevent materials from anchoring to the bottle, they are not effective at reducing the attractive properties of SCP-3917. Placing SCP-3917 in a low pressure environment removes all attractive properties. Objects anchored to SCP-3917 are immediately released and lose any attraction to the bottle. Once placed in greater than one atmospheres of pressure, all anomalous properties return to SCP-3917. Addendum: SCP-3917-2 is a reanimated instance of SCP-3917-1, first collected after the events of Experiment Log #3917-2. 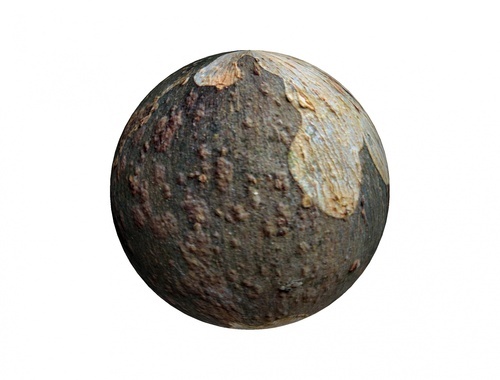 SCP-3917-2 is a sphere with a diameter of 3.0 3.3 3.4 meters, composed of various forms of silicon based debris as well as the body of Agent [REDACTED]. SCP-3917-2 is seemingly unaffected by outside forces such as gravity and floats above the floor of its containment cell. Discovery: SCP-3917 was recovered 25/07/20██, 33 meters off the coast of ████████, Nova Scotia after residents noticed a large sand bar form and increase in height over the course of three days. At the time of recovery, SCP-3917 had acquired a shell consisting of 13.2 meters of anchored sand particles. The entire shell, including SCP-3917, was raised from the water using a freight helicopter. After approximately 30 seconds, the helicopter lost power, falling and crashing into the beach. Particles of broken glass were seen moving out of the wreckage and along the ground towards the shell. The shell continued to grow steadily for the next three hours while Foundation personnel prepared a secondary method of transportation for SCP-3917. A large dump truck was modified to carry the shell, having all glass removed from the windows. It was moved to the recovery location alongside a large crane. The shell, now well over 15 m thick, was lifted into the bed of the truck. Sand could be observed moving up the exterior of the truck and into the bed. Foundation staff were able to cover the mass of sand and glass with a large sheet of tarpaulin. It was noted that sand on the outside surface of the tarp was unable to anchor to the shell and maintained a free range of movement despite its close proximity to SCP-3917. With SCP-3917 no longer surrounded by a large source of sand, the growth of the shell greatly slowed. On the way to Site-312, the truck experienced a large change in altitude. At approximately 340 meters above sea level, SCP-3917 transitioned to an inactive state, collapsing the shell back into a loose mound of sand and debris. Agents were able to recover the inert SCP-3917 and transport it the rest of the way to Site-312 for containment without incident. It is noted that after the freight helicopter was inspected after the crash, it was found that all electronic circuit boards had fractured from exposure to SCP-3917. Rationale: To ascertain the source of SCP-3917's anomalous properties. Procedure: The screw on cap of SCP-3917 is removed and placed to the side. Tweezers are used to remove a single beetle, from here forth referred to as SCP-3917-1, from suspension and is placed on an acrylic platform for closer analysis. The alcohol coating the instance of SCP-3917-1 began evaporating at an expected rate. The instance of SCP-3917-1, after losing a portion of its coating began exhibiting a heightened form of silicon attraction. The instance of SCP-3917-1 is placed back into the hand sanitizer solution and the bottle is once again sealed. All anomalous properties promptly ceased upon placement of SCP-3917-1 back in suspension. Results: A total of three Foundation staff reported a loss of power in their personal computers. One of the three, a Class-2 personnel, had a pair of glasses torn from his face and smashed against the wall next to him. Several objects, including two coffee mugs, sixteen surplus computer monitors, a plant pot, a wristwatch, three wall mounted analogue clocks, and a glass cat paperweight were destroyed after being flung in the direction of the instance of SCP-3917-1. All objects were measured to be within 300 meters of SCP-3917-1. Containment procedures updated to reflect enhanced range of SCP-3917-1's attractive properties. Additional measures put in place to maintain alcohol suspension of instances of SCP-3917-1. Worth noting is that the glass bottle containing the remaining instances of SCP-3917-1 is unaffected by the attractive effect of the single separate SCP-3917-1 instance activation. Analysis: It appears that SCP-3917 gains its anomalous properties from the beetles contained within. Further analysis of SCP-3917-1 is made difficult due to lack of analogue magnification devices not containing silicon. Suspension in alcohol appears to reduce the effects of SCP-3917's anomalous properties. Rationale: To observe the anchoring of silicon to a fully active instance of SCP-3917-1. Procedure: Another single instance of SCP-3917-1 is removed from suspension and the alcohol coating is allowed to fully evaporate. A special built microscope using acrylic in place of glass is commissioned and the instance of SCP-3917-1 is placed under magnification. A one gram sample of sand is brought within the range of attraction allowed to make contact with SCP-3917-1. Results: Particles of sand are observed to make contact with the carapace of SCP-3917-1. Both the sand and SCP-3917-1 are lifted off the ground and begin to hover in the air. Foundation personnel are able to disable the anomalous properties of the instance of SCP-3917-1 by reducing the atmospheric pressure in the containment chamber to 0.2 atmospheres, at which point both the sand and SCP-3917-1 fall to the floor, unanchored. It is observed that SCP-3917-1 has now become animate. From here forth, the animated instance of SCP-3917-1 shall be referred to as SCP-3917-2. A secondary acrylic box is constructed for SCP-3917-2 in the same chamber as SCP-3917 and SCP-3917-2 is placed inside. Containment procedures have been updated to reflect this change. Analysis: It appears that the attraction of silicon is some anomalous biological response of the luprops tristis beetles contained within SCP-3917. Further observation of SCP-3917-2 is ordered and entomologist Dr. Rajesh is brought in to provide care to the specimen. SCP-3917-2 does not appear to require food or water, nor does it show any fear of being handled by Dr. Rajesh. Other than these properties, SCP-3917-2 behave identically to a mundane luprops tristis. Render of SCP-3917-2 based on topographical scans. No photographs can be taken due to the constant attraction of SCP-3917-2. Event Summary: Dr. Rajesh is asked to introduce a non anomalous luprops tristis specimen to SCP-3917-2. Both insects are observed to mostly ignore each other. The length of the test is extended and Dr. Rajesh is asked to feed and water the non-anomalous luprops tristis. The two luprops tristis cohabited for a total of six days together with no notable interactions, at which point the experiment is concluded. When Dr. Rajesh opens the enclosure to retrieve the mundane specimen, SCP-3917-2 takes flight, and escapes containment. Dr. Rajesh is escorted out of the containment cell and a recovery team is brought in to re-contain SCP-3917-2. At one point SCP-3917-2 flies straight towards Recovery Agent [REDACTED]'s face, where it lands. [REDACTED] begins to panic, swatting wildly at SCP-3917-2. SCP-3917-2 is crushed in the commotion. Immediately a pulse of attraction emanates from the corpse. All electronics, glass, and other silicon compounds 500 meters are drawn towards the location of SCP-3917-2 with previously unobserved speed. Site-312 experiences complete power failure and crushed silicon debris push through several layers of reinforced walls, allowing SCP-████ to breach containment. A total seventeen Foundation personnel were lost before SCP-████ could be re-contained and power could be restored to the facility. SCP-3917-2 could not be recovered and is now encased within a three meter diameter sphere of silicon debris suspended approximately 180 cm off the floor of the containment cell. Unfortunately, no efforts to remove the debris have been successful as the debris has anchored to the SCP-3917-2 specimen and completely seal it in. It is unknown as to whether SCP-3917-2 is currently reanimated. New containment procedures to prevent further anchoring to SCP-3917-2 have since been put in place. Attempts to reduce the amount of atmospheric pressure in the vicinity of SCP-3917-2 have been unsuccessful at disabling the anomalous properties of SCP-3917-2. No further experiments on SCP-3917 are to conducted. 1. Common name "Mupli beetle"